2000 subscriber limit with 12000 emails allowed per month. 500 subscriber limit with 1 daily mailing allowed. The subscription box to the right is an example of the Bravenet Mailing List Service. 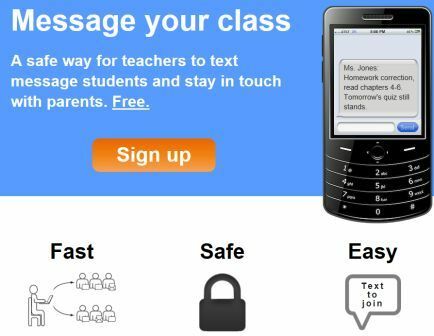 Created for teachers and students to seamlessly create text and/or email reminders for assignments, projects, quizzes, tests, labs, class activities and homework. Teachers create accounts, upload syllabi, insert all class projects, activities, homework and assignments. Then students can log in to Remind101, search for their class, subscribe to the class, and automatically start receiving all reminders for the class activities. Students can add new reminders, or personalize the text alerts to be for only certain types of activities. One of the best aspects of this site is that it is quick and easy to use. Instructors can also use the same class site over and over again, just changing the due dates. The site works with any cell phone that has SMS text messaging! gText allows you to send text messages to groups that you have created in your gText account. Your texts can be sent from your phone or from your computer. By default gText keeps group members' phone numbers private. Group members who want other group members to see their numbers can allow that. Beyond simple text messaging gText offers options for sharing files (although that could consume a lot of space on a phone), sharing images, and sharing calendars.